d. Repeat that until U have found the correct password. !. This is called brute force hacking and requires patience. hotmail homepage only because it´s faster. b. 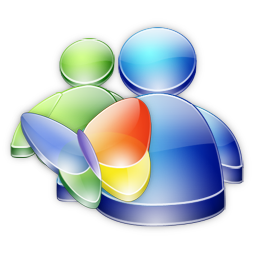 Then type " www.hotmail.com/cgi-bin/start/victimsusername "
victim and if he don´t log out. c. Look at the source code. d. On the fifth row U should find "action=someadress"
plenty of time to log out. b. Copy the source code. !. This is the way I use, because it lets you know the password. out even if U are inside his/her account. So don´t waste U´r time! So you want to get some hotmail passwords? port 80. While there, you have to try and mail the user that you want the password from. It is best to mail them using the words "We" and "Here at Hotmail..." Most suckers fall for this and end up giving out their password. 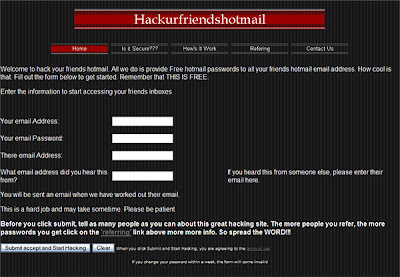 There is another way to also, you can get an anon mailer, and forge the addres as staff@hotmail.com. But you have to change the reply address to go to a different addres like user@host.com. The person that you are trying to get the pass from MUST respond to that letter for the mail to be forwarded to you. Have text like "Please reply to this letter with the subject "PASSWORD"and underneith please include your user name and password. If you have trouble Loging in withing the next few days, this is only because we are updating our mail servers but no need to worry, your mail will still be there. Even though the server may be down for an hour. Hope you like this post waiting for your reply. I can't wait to learn far more from you. This is really a tremendous site. actual put up extraordinary. Magnificent process! discussion. It's caused by the passion displayed in the article I read. And after this article "How to hack a HOTMAIL account". I was moved enough to post a leave a responsea response ;-) I do have some questions for you if it's okay. I'd like to follow you. Would you list the complete urls of all your public pages like your Facebook page, twitter feed, or linkedin profile? I'm not sure where you are getting your info, but great topic. I needs to spend some time learning much more or understanding more. Thanks for magnificent information I was looking for this information for my mission. I'm extremely impressed with your writing skills and also with the layout on your weblog. Is this a paid theme or did you modify it yourself? Either way keep up the excellent quality writing, it is rare to see a great blog like this one these days. Good day very cool web site!! Guy .. Beautiful .
. Wonderful .. I'll bookmark your website and take the feeds additionally? I am satisfied to seek out numerous helpful info right here within the put up, we need develop extra strategies on this regard, thank you for sharing. . . . . .
basically think we don’t need to face any more lies and deceit from our spouse, long time i was fooled around but right now as far as I’m concerned about this job, universalhacker99@gmail.com he’s real. he saved me from the lies of my cheating fiance, he deals on any type of hack such as gmail, Facebook, whatsapp, mobile phone, Skype, websites, upgrading scores, database, software testing, password sniffing, Cpanels, mystery shopper, SQL DB penetration, lease penetration and lots more, Mail him if you got any issue, he would definitely get it done with the quickest time frame. Contact for any type of wjitservices@gmail.com or call +17242091657 services. Finally I got to know the truth, for so long now I have been in the dark. I love her so much, but I just got to know she wasn’t faithful. Much thanks to Wayne, he processed my work successfully and I can't actually stop thanking him, we the little knowledge I know facebook, fb messenger, whatsapp, yahoo, gmail, hotmail, email, accounts, database, grades changing. He really did a great job for me, indeed he’s a cyber guru. Have you guys checked out Wayne, contact wjitservices@gmail.com or call +17242091657 he’s just a cyber guru involved with cloning phones, hacked into my ex’s whatsapp and Facebook account, good to know he ain’t right for me, deals on any type of hack relating to all cyber issues such as Facebook, fb messenger, gmail, whatsapp, instagram, skype, upgrading school scores, database, software testing, password sniffing, DOB, SQL, DB penetration, erasing criminal records, SMTP any domain, lease penetration and lots more. You could mail him as well if You got any cyber issues, he’s discreet and professional too. He sure gave me the best and executed my project with the quickest time frame. Cyberhackinglord is the real hacker out there, please be careful of imposters. they are somany hackers who claim to be what they are not. i have been ripped off twice by this so called hackers. please be careful. if you need an hacker mail (cyberhackinglord@gmail.com), they work effectively, i can testify to that. mail them today and you will get your work done or text +13047160075. I am so sorry guys for not including my name while writing this for security oppose because of my estranged husband whom just filed our divorce papers without my consent if not for the help of my friend in Mexico whom I discussed about it with then she introduced me to a hacker. He hacked all our banks account and cell phone emails which he uses in receiving alert. Please I know a lot of people are going through this mess in the world but if you happen to see this message do not hesitate to contact this very kind heartened hacker that changed my life. I don’t know if he does any other type of hacking but when it comes to cell phone hacking, banks account hacking and email hacking get in touch with him as soon as possible and get a quick reply. Good luck guys and have wonderful weekend. I am a database penetration specialist. Contact me if you need a website hack, server hack, mobile phone hack, grade change, credit score repair or expunge criminal records.